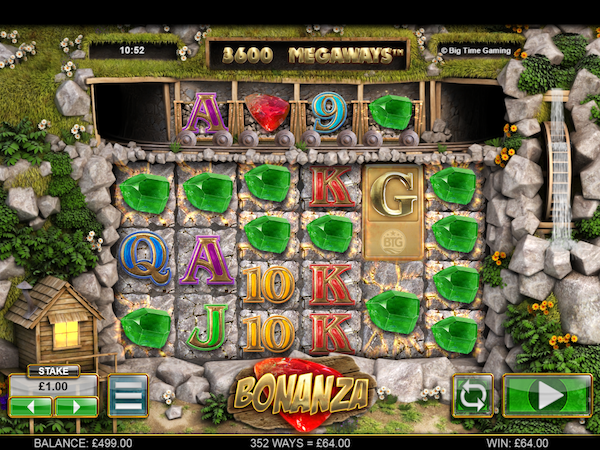 If you're looking for something a little different and mega wins then you might just strike gold with Bonanza. This slot is pretty much unlike any other game! Freespins, Big Time Gaming's Megaways and Win Reactions all feature in this exciting slot. Set inside a mine, Bonanza is a 6 reel slot with 7 lines plus an additional 4 lines that appear above reels 2, 3, 4 and 5. Symbols on the main reel can expand so when you first spin everything looks a bit haphazard. Above the reels are those extra 4 symbols - brought in on a mini railway. Above that you'll find the Megaways counter. Megaways are a feature of Big Time Gaming slots and they refer to the number of win lines in play! The maximum number of possibel win lines is an incredible 117649. Wagering on Bonanza starts at just 20p but can be adjusted up to a maximum of £20. Use the stake button to select your wager. An autoplay feature is available. This can be found by selecting the blue stripe button and clicking on the autplay tab. Paytables and other game info can be found at this point too. The symbols on Bonanza comprise of playing cards and jewels. The round diamond is the highest paying jewel at x50 for 6 of a kind. The ruby is the next best paying symbol at just x7.5! Although this doesn't sound a good return, the multiple lines help boost wins in what we'd describe as a high variant slot. Don't forget too that every win line causes a reaction - winning symbols are removed from the reels and new ones drop into play. This continues until you lose. Wilds are represented by dynamite symbols and scatters are the gold bars. Get four gold scatters to activate a free spins round. The minimum number of spins is 12 but this increases by 5 with every additional scatter. During the free spins round, there is an unlimited win multiplier that starts at 1 and increases by 1 after each reaction. Extra free spins can be picked up if scatter icons appear in the carts. Three scatters generates five free spins whilst four rewards the player with 10 extra spins. Bonanza is an exciting slot. It can appear quite busy but the graphics are good and it's full of features. Individual win line payouts appear small, but then you could potentially have several thousand win lines in play. Play Bonanza today at Slots Gold. It's available for mobile, tablet and desktop players. Other Big Time Gaming slots include White Rabbit, another Megaways slot, and Danger High Voltage.